A highly trained professional makeup artist, Fay, has the art for making people radiant and beautiful on their special day. Her talent of enhancing your best features with an everlasting flawless makeup application makes her a sought out make up artist. Available in the tri-state area ( New Jersey, New York, Upstate and Brooklyn.) Try the latest techniques of Airbrushing for a georgous long lasting look. Reasonable rates. Get more for your wedding! 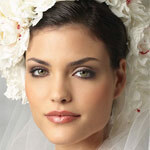 Don't forget to mention ChossonKallah.com when visiting Flawless Faces - Fay Blau.